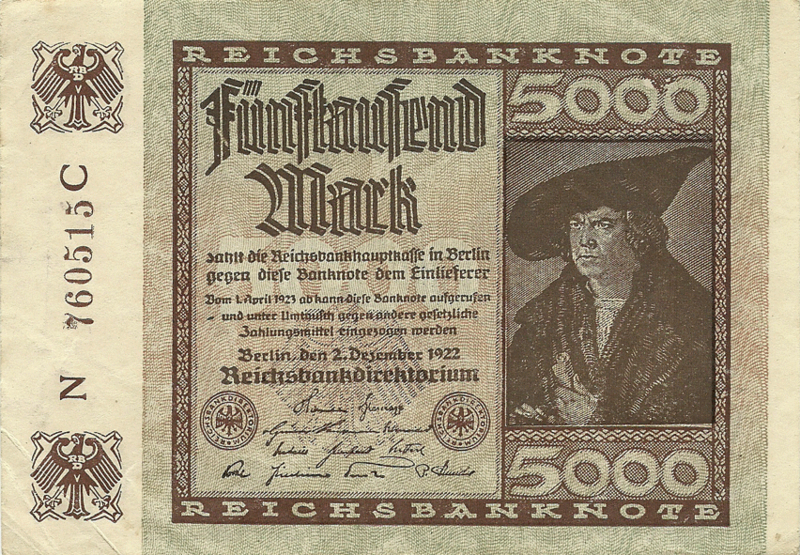 On these banknotes of Third Issue is watermark - Z- und Sternmuster mit G und D, which consist of straight lines, forming letter "Z" and hexagonal stars, in there are repeatedly, light on dark background, letters "G" and "D" - stands for company "Giesecke & Devrient" (printer). 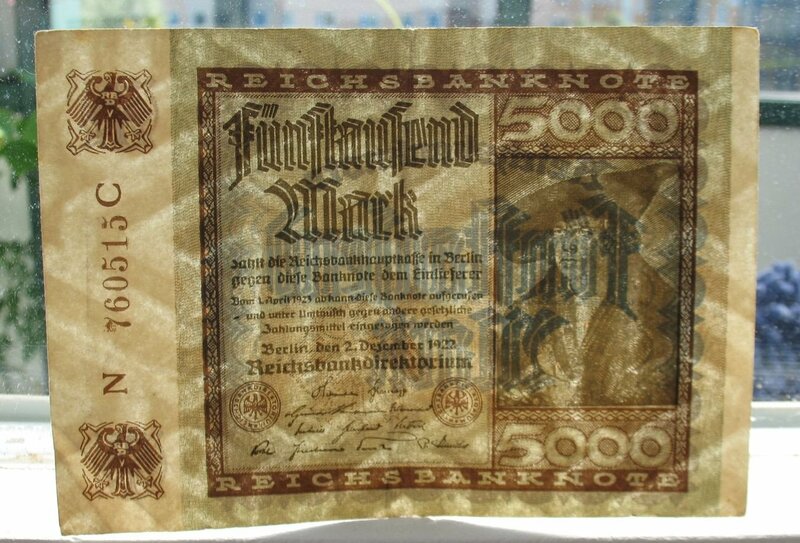 Sourse: Announcement of Reichsbank from 27 September 1922. Z-, stars, G and D inside. 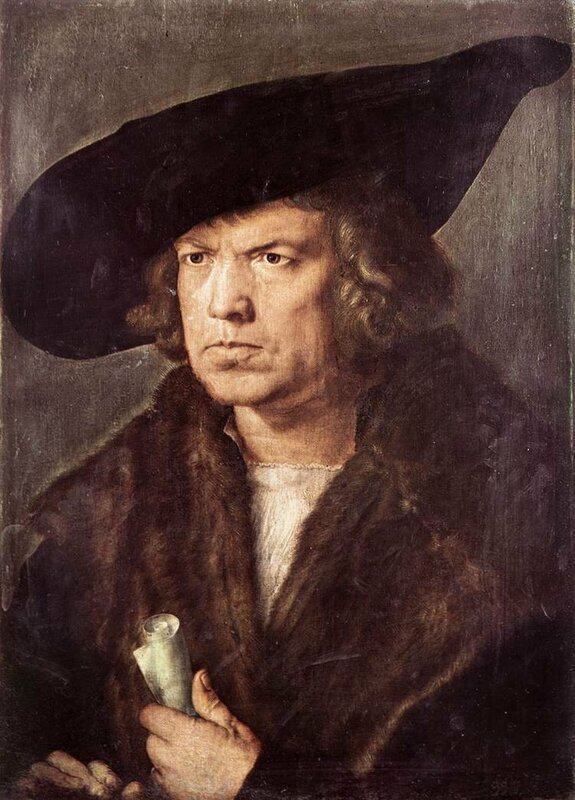 On right side is the painting by Albrecht Dürer "Portrait of Hans V. Imhoff", 1521. Oil, canvas. Held in "Museo del Prado", Madrid, Spain. Hans V. Imhoff (1461-1522) - The Nuremberg trader, the founder of the three existing Protestant lines. Albrecht Dürer (21 May 1471, Nuremberg - 6 April 1528, Nuremberg) was a painter, printmaker, and theorist of the German Renaissance. Born in Nuremberg, Dürer established his reputation and influence across Europe when he was still in his twenties due to his high-quality woodcut prints. He was in communication with the major Italian artists of his time, including Raphael, Giovanni Bellini and Leonardo da Vinci, and from 1512 he was patronized by emperor Maximilian I. In left lower and top corners, also centered (on background) are the eagles from German coat of arms. 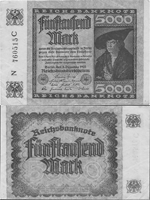 In the center the text says that, from April 1, 1923, these banknotes are put into circulation and must be accepted for payment, along with other means of payment. Denominations in numerals are repeated 3 times, in words - at the top. Rosette with pattern and denomination. Text: "Wer Banknoten nachmacht oder verfälscht, oder nachgemachte oder verfälschte sich verschafft und in Verkehr bringt, wird mit Zuchthaus nicht unter zwei Jahren bestraft." "Anyone who imitates or distorts banknotes, or imitates or falsifies himself and puts them on the market, shall be punished with prison not less than two years." 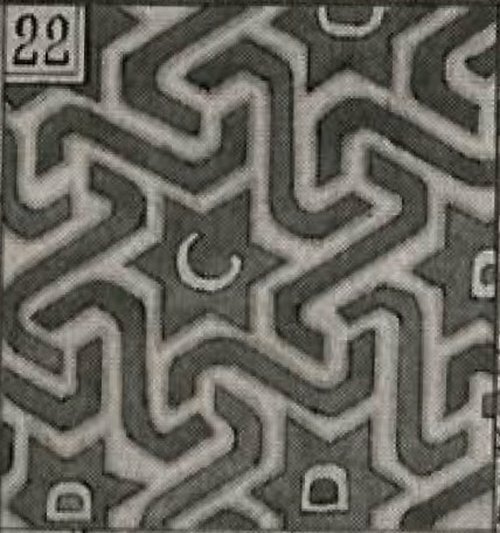 Paper with this watermark was originally produced by the fine paper manufacturer "Felix Schoeller & Bausch" of Neu Kaliss for "Giesecke & Devrient". 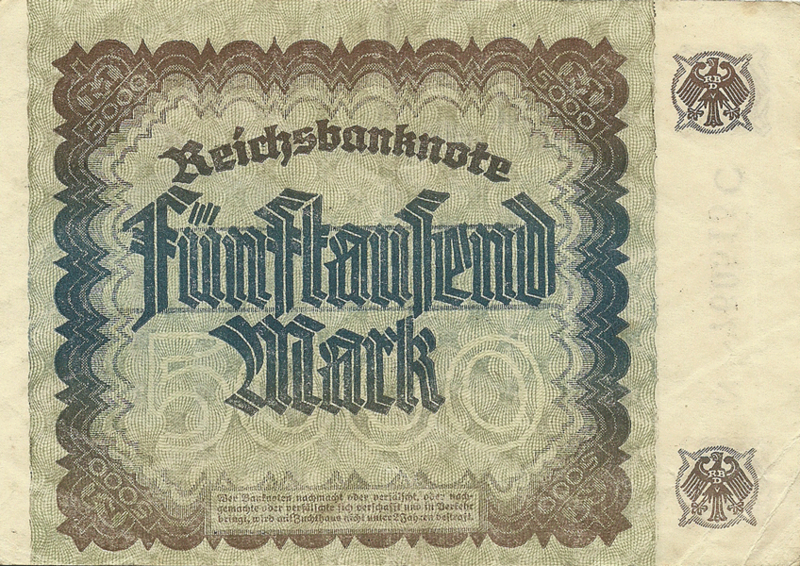 After the use of the pattern in the production of Reichsbanknoten, it was produced by a large number of other companies and was no longer used by "Giesecke & Devrient".